The main scope of this project is to provide architecture of Software Defined Radio (SDR) for military purposes and a military High Data Waveform (HDR WF) compliant with such architecture, thus offering the normative referential required for development and production of software radios in Europe. In addition, the project will deliver guidelines which are related to the validation and verification of waveform portability and platform re-configurability, setting up a common security basis to increase interoperability between European Forces. The ESSOR products will be based on Software Communication Architecture (SCA) developed originally in the United States in the Joint Program Executive Office for the Joint Tactical Radio System (JPEO JTRS) programme. The main scope of this programme is to provide a Software Defined Radio (SDR) architecture for military purposes (called ESSOR Architecture) and a military High Data Rate networking wideband Waveform (HDR WF) compliant with such architecture, thus offering the normative referential required for development and production of software defined tactical radios in Europe. The ESSOR Architecture extends the public part of the Software Communications Architecture (SCA), originally developed in the United States in the Joint Tactical Radio System (JTRS) Programme, in order to facilitate waveform portability amongst the ESSOR PS, and maximising the compatibility with the SCA. It is a complete and consistent secure SDR architecture which fosters waveform portability amongst heterogeneous military SDR platforms. The ESSOR Architecture specification was completed in December 2010 and afterwards implemented into the six different national SDR platforms used in the ESSOR Programme, setting up a common framework for the porting of military waveforms onto those SDR platforms. The porting activities of the HDR WF are demonstrating that the ESSOR Architecture is well suited to improve the portability of military waveforms. Therefore the ESSOR Participating States decided to offer the ESSOR Architecture to third party states interested in the porting of military waveforms onto their own national SDR equipment. Additional information concerning the ESSOR Architecture can be obtained contacting the Programme Division. Enhances connectivity on the battlefield by providing a full secure(COMSEC/TRANSEC/NETSEC) High Data Rate network. Enables growth capacity of the forces through ad hoc network, self-organising / self-healing, including synchronization with and without GNSS. • Mobility management for nodes. • Communication on the move. • Vertical / horizontal communications. • Transverse network used to interconnect CNR networks and/or Area Networks. • IP Inter-networking between HDRWF network and legacy/future networks with compatible security policy levels through open interfaces. The HDR WF specifications, verified through Hi-Fi simulations, were accepted mid 2012. The specification phase was followed by the development of the base waveform software application, which is non-radio-platform dependant software implementing the algorithms and functionalities defined in the specifications. This base waveform can be envisaged as a software instantiation of the HDR WF specifications, which includes several dual software components easing the porting onto SDR platforms with different kinds of hardware processors. The last HDR base WF validation activities finished in September 2014. The availability of this highly portable software instantiation of the waveform specifications promotes the HDR WF as an excellent candidate solution for the NATO Wideband Waveform STANAG. A specific paper was published by the ESSOR community, in the WinnComm 2014 conference, describing the ESSOR software development methodology, titled : ESSOR HDR Base WF – Methodology and results for developing a portable coalition waveform software. Copy of the document can be obtained by contacting the ESSOR Programme Division. The base waveform is being ported onto the different ESSOR-Architecture-compliant national SDR platforms in several functional increments (called “drops”). The national porting activities are now focused in the functional drop which includes the waveform “essential capabilities” (including ad hoc network, self-organising / self-healing with and without GNSS, IP Services, video streaming, connection with external networks, etc.). Several national Functional Qualification Reviews(FQRs) have been already successfully performed at that functional level, validating those national waveform implementations as ready for interoperability testing. The first interoperability FQR (at the “essential capabilities” level) was successfully conducted in December 2014. This milestone will be of paramount importance, as it will demonstrate worldwide that the coalition interoperability in military radio-communications is achievable through the porting of waveform software applications(developed in a cooperative manner) onto different national SDR platforms from different vendors. The remaining porting and interoperability activities at the “complete” functional scope were completed during the first half of 2015. 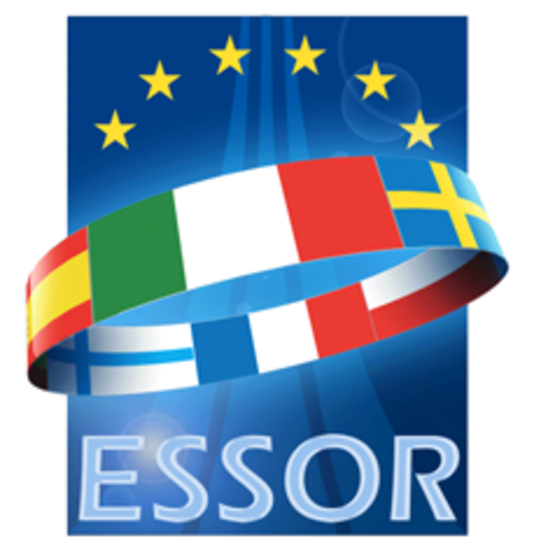 Nevertheless, the ESSOR community is currently defining the next phase of the programme, which will include the Operational Deployment of the HDR WF (including Field Tests), technical enhancements of the ESSOR products (to cover a wider range of operational requirements) and considerations for the standardization of those products. A specific paper was published by the ESSOR community, in the MILCOM 2013 conference, providing a general overview of the ESSOR HDRWF capabilities, titled : ESSOR HDRWF – Capabilities and perspectives of an innovative coalition waveform. Copy of the document can be obtained by contacting the ESSOR Programme Division. The ESSOR PSs decided to publish the ESSOR Architecture, to allow the global SDR community to benefit from the expertise achieved in ten years of development, and to use it as a building block of future interoperable SDR applications. The first national Software Defined Radio (SDR) workshop of the ESSOR Community was held on February 21st 2019, at the Roma Tre University in Rome (Italy), through the patronage of the Italian Directorate for ICT and Advanced Technologies (TELEDIFE). This workshop is the first of a series of initiatives that the ESSOR Programme Committee has decided to launch, within every ESSOR Participating State to foster the diffusion of the “ESSOR Culture” in Academia. and six prime European industries signed their ESSOR Shareholders Agreement and founded todays’ a4ESSOR, and all together signed the ESSOR Contract and gave birth to the ESSOR Program. At today’s OCCAR-EDA bilateral in Bonn, OCCAR Director Arturo Alfonso-Meiriño and the Chief Executive of the European Defence Agency, Jorge Domecq, have exchanged letters describing the role of the EDA in support of the ESSOR Programme. May 2018 saw the ESSOR Programme Division actively contribute to two important events in parallel: a "PESCO Workshop” organised France and Italy in Paris on 24 and 25 May, and the Wireless Innovation Forum in Madrid, on 23 and 24 May. For further information about the ESSOR Programme, please contact the Programme Division or the Prime Contractor.